Number60 is a private, peaceful holiday retreat, nestling in mature native bush, a short walk from Onetangi beach. It’s located in a sheltered and quiet area: adjacent to the Forest and Bird Reserve which offers beautiful bush walks and bird life. Surrounded by Nikau palms, Puriri and Kanuka trees, it’s a favourite spot for visiting Kereru and Tui. Kaka are also about as with Grey Warbler and Fantail. The 3 bedroom single level house provides comfortable open plan living, great indoor/outdoor flow, large decking with a gas BBQ and drive on access. A 400 metre trip (5 min for the average person at normal walking pace) through the Pohutakawa Reserve leads you to the beach with 2 km of golden sand, one of the most beautiful on the island. There are plenty of other activities available close by: world class vineyards, fishing charters, kayaking, paddle boarding, magnificent bush and vineyard walks and coastal tracks, horse riding and the ECOZIP for an extra thrill. There is also a 9 hole golf course close by. Two licensed cafes on the beach front offer a range of food and beverages throughout the day and in the evenings. Note that the Council maintained walkway through the Reserve, while with a great vista, is steep in parts and involves steps that could be difficult for those with mobility issues ( the road can be an alternative for some). Waiheke is an under developed and hilly island that is essentially part of its charm and accordingly accessibility can be an issue for those with disabilities. 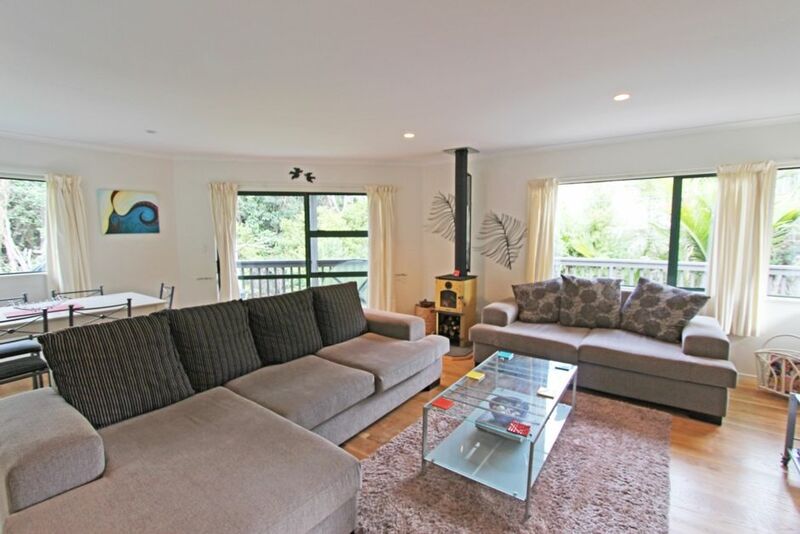 Suitable for families or couples, this property provides a real taste of Waiheke living. Relax in front of the wood burner on chillier evenings (wood supplied) and enjoy the books and DVD's available. The deck is fully fenced with gate. A Master ensuite provides for greater privacy and convenience for guests. The property has off-street parking for many cars however the carport may not be available from May to November. Please contact us for more details via the booking enquiry option. Very sheltered location on the edge of the Forest andamp; Bird Reserve with abundant bird life. Good location. Clean and good layout. Location was excellent for visiting Onetangi beach and accessing Casito Mero, the Batch & Te Motu vineyards. The Bush provided the contrasting landscape although uncertain of the best track down to the beach. Appreciated the recommendation to the nearest local takeaway. Great burgers and fish n chips!! this property has everything you need. Awesome house in a quiet setting. Awesome house in a quiet setting. Comfy beds and couch. Everything we needed for a relaxing trip. Great property had everything you needed for a pleasant stay.